Controlled drug delivery systems have been utilized to enhance the therapeutic effects of many current drugs by effectively delivering drugs in a time-dependent and repeatable manner. With the aid of 3D printing technology, novel drug delivery devices can be fabricated to enhance efficacy and processability. The evolution of 3D printing technology allows for the feasibility of personalized medicine to become more and more promising. Using various forms of 3D printing such as extrusion-based and stereolithography, the fabrication of various controlled release devices was possible for the applications of both tissue engineering and cancer vaccinations. By manipulating printing parameters such as hatching, slicing, and size, along with different synthetic and natural polymers, we were able to design devices capable of sequential, pulsatile, and sustained drug release. Our results suggest that printing materials and parameters are important in designing devices and structure to tailor the controlled release of drugs. 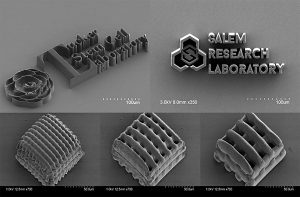 With the understanding of how all these components play a vital role in the release kinetics of various drugs and the ability to fabricate complex structures with fine precision and detail, 3D printing technologies provide a method for developing more effective treatment systems that are translatable for a plethora of diseases.